The demand for curtains and blinds is gradually growing everyday due to the increase in craze over home décor and furnishing. Different people have become more specific in choosing the interior design and materials for their homes. In your endeavor to get a stylish and good look for your house interior, you may be stuck in a difficult situation in choosing whether to use blinds or curtains. This has become a very tricky issue for many people. Here are six clear-cut and very justifiable reasons why you should choose blinds over curtains. Cleaning the house can be a very demanding and tiring task. However, blinds are very easy to put up with. This is because blinds require very little maintenance as compared to curtains. When cleaning blinds, you need to have wet or damp cloth and you don’t need to bring them down just like in the case of curtains where you must pull them down from the pelmet in order to wash them. This might take longer to dry or put them in a washing machine, which is a little wastage of power and time. Blinds are also long lasting than curtains. They are made of tougher material than curtains, which is made of cloth; hence, blinds are tougher to tear than curtains. Many blinds, especially the roller blinds are very easy to put up. You will not require professional training or a carpenter to install as you can do it yourself. In the case of curtains, you will require to call up a carpenter to come and take measurements and put up a handle. With blinds, you will save on time and the fee you will have to pay a carpenter for labor. The overall cost will be favorable to blinds as there are cheaper blinds than curtains out there in the market. There is a wide range of blinds to choose from as compared to curtains. Blinds are made of a range of materials including wood, bamboo, PVC, faux wood, and aluminum among others while the curtains are limited to only plastic and cloth. In addition, window blinds come in a variety of colors, patterns, and styles from where you can choose the perfect look that suits you. This is because the blinds are separated and can accommodate more than one style in a single widow as compared to curtains. 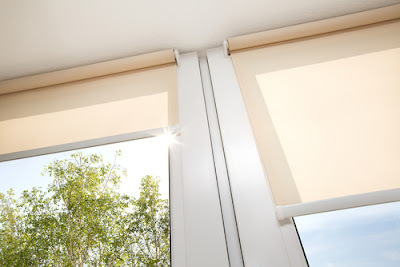 It is easier to control the amount of light entering your room with the use of blinds as compared to curtains. According to your preference, blinds can cover the whole window or part of the window. If you need to black out the room, it is very easy with blinds, but with curtains it is very hard as they are more susceptible to wind that will make them drift inwards and allow light. Blinds are, however heavier, more compact, and mounted in close proximity to the windows. They are also passive to wind. This makes them the best option in blacking out a room; Blinds also offer a better light control mechanism than curtains. You can adjust the amount of light preferred unlike curtains where you only have two options, either to open them or close them. The design of the blinds makes them appear better than curtains. They are more stylish and elegant than curtains, especially when it comes to an office, blinds are much better than curtains as they provide a neat and crisp look to the room. Curtains have a nagging tendency to fade with a couple of washes hence they may add blemish to the look of a room or office. When you take a look at a room with window blinds and compare it with a room with curtains, the room with blinds is easier on the eye. It is rather obvious that blinds are more durable than curtains. Blinds are made of tougher material and therefore will require much more mischief from your children to ruin them. However, with curtains, a simple thing such as a spill of juice on them can leave a permanent stain making them useless. Moreover, curtains are made of cloth and tend to fade with time. In addition to this, curtains are often close to the floor increasing the chances of accidents. In the case of blinds, it will take a lot of effort and intention to damage them. In case of damage, you can repair part of the blinds while with curtains, once damaged, you will have to buy the whole thing again.